Wounds or sores that take more than a few weeks to heal might be infected and require medical treatment, and often indicate an underlying disease such as diabetes. When you cut or burn yourself, your body begins a three-stage process to repair the damaged skin. First, an immune response causes the wound to become inflamed to prevent infections. Second, new cells (a scab) form over the wound, and finally scar tissue forms to heal the wound. Some wounds heal easily while others can take longer, particularly if they are severe or the individual has a poor state of health. 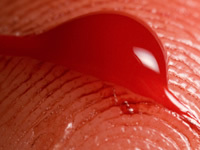 High levels of blood glucose caused by diabetes can, over time, affect the nerves (neuropathy) and lead to poor blood circulation, making it hard for blood - needed for skin repair - to reach areas of the body affected by sores or wounds. Keeping blood glucose levels under good control can help to reduce the risk of slow healing wounds now and further in the future. Slow healing wounds can be a symptom of undiagnosed diabetes, particularly if other symptoms are also present. Slow healing of wounds, including cuts, grazes and blisters, can be particularly problematic if they affect the feet of someone with diabetes and if not treated properly, can raise the risk of amputation. It is important therefore that people with diabetes check their feet daily and report any signs of damage to their health team. If you do not have diabetes and a cut or burn is taking a long time to heal or showing signs of infection, consult a healthcare professional to have the wound examined. In some cases, a slow healing wound could signal an underlying medical condition such as diabetes. Because of the risk of amputation, it is important, if you have diabetes, to consult your health team if you have any signs of damage to your feet. Wounds on the feet, or any other part of your body, should be closely monitored.